Arizona is known as the Grand Canyon State. 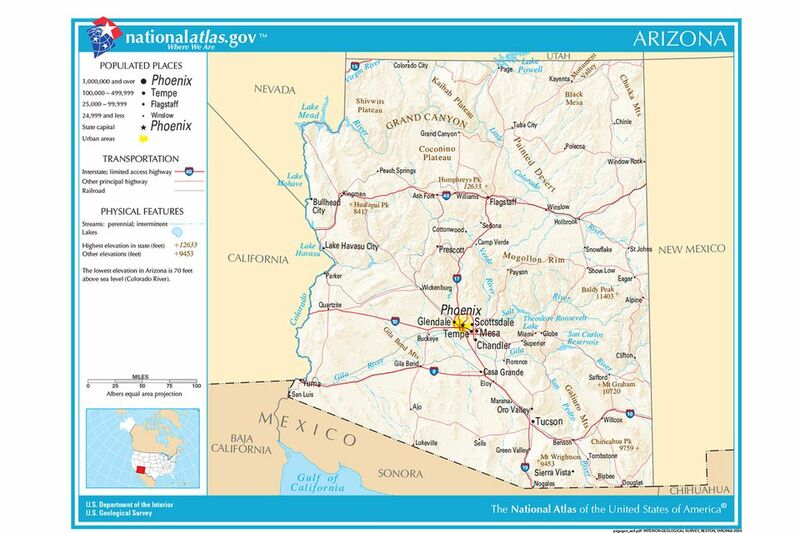 The main cities and urban areas in Arizona are Phoenix (the Capitol), Tucson and Flagstaff. Arizona is one of the Four Corners states. It borders New Mexico, Utah, Nevada, California, touches Colorado, and has a 389-mile (626-kilometer) international border with the states of Sonora and Baja California in Mexico. Arizona is known for the heavily-visited Grand Canyon National Park, Hoover Dam which is located on the Nevada-Arizona border and the Saguaro cactus-studded Sonoran Desert. Visitors enjoy the pine woods of northern Arizona and the Wild West history of southern Arizona where you'll find Tombstone and the mining town of Bisbee. Arizona is also home to the Navajo Nation or Diné Bikéyah, (with parts also in Utah and New Mexico), the largest Indian Reservation in the United States. Colorado is known as the Rocky Mountain State. Colorado is known for its ski areas and stunning beauty. Denver is the capital and largest city. Colorado Springs is the next largest city and is home to the United States Air Force Academy. The Rocky Mountain National Park is a must-see in both winter and summer with mountains, forest, and high country tundra. New Mexico is known as The Land of Enchantment. The capital is Santa Fe. Other large towns and tourist draws are Albuquerque, Taos, and Gallup. New Mexico is known as a Native American art and cultural center with many Native American pueblos including the often-visited Acoma Pueblo (Sky City) and Zuni Pueblo south of Gallup. New Mexico is also home to natural areas such as Carlsbad Caverns in the southern part of the state and White Sands National Monument and Bandelier National Monument to the north. Nevada is known as the Silver State. It is quite a draw for people who enjoy glitz, glitter, and gambling. Las Vegas is the most well-known tourist city. Carson City, which is quaint and small, is the capital. Other towns of interest are Reno and South Lake Tahoe with outdoor recreation, winter sports and, of course, gambling. Texas is known as the Longhorn State, but mostly Texas is known for being BIG! The capital is Austin, famous for music and barbeque. Large cities are Dallas, Fort Worth, Houston, and San Antonio. Visitors to Texas enjoy the large cities as well as history and natural beauty. San Antonio with its missions and scenic downtown River Walk is a major draw. Utah is known as the Beehive State, referencing the hard work of the founding Mormon pioneers. Utah is bordered by Idaho and Wyoming on the north and by Arizona on the south. On the east, Utah is bordered by Colorado. On the west, Utah is bordered by Nevada. Salt Lake City is the capital and houses the main Mormon Temple and Temple Square as well as many Mormon pioneer historical sites. Utah is also known for natural beauty and is home to the "Mighty 5" national parks which include the beautiful Zion National Park and Bryce Canyon National Park with its red hoodoo formations. Reference map for your Southwest trip. The states of Colorado, Nevada, Utah, Texas, Arizona and New Mexico make up the Southwestern United States.